I expect you’re wondering – I was too until just a few days ago and yet here we are at day three and I haven’t skipped – go me! 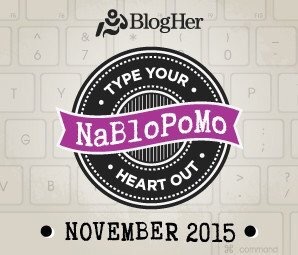 So, what IS #NaBloPoMo? Let’s head over to bloher.com where they have the perfect explanation. Essentially there’s a whole host of us aiming for 30 posts in 30 days. It’s ambitious, it’s foolhardy and by the end of it you may well be getting an awful lot of photo posts! This was the first post I read on this blogger challenge and it’s the one that persuaded me I should dive in and take part. There’s lots going on for me this month, I’m turning 50 next week, I’m having a new kitchen fitted as we speak and I have several exciting social events in the calendar, so hopefully I won’t struggle TOO much for subject matter. It’s not too late to join in! If, like me, you find yourself in a bit of a blogging dry spell, this could be the way to kickstart things before the New Year! Happy blogging and see you tomorrow!